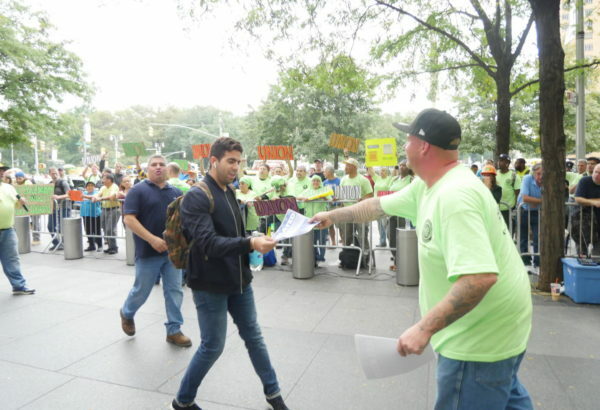 New York, NY – Passersby in front of Related Cos. CEO Stephen Ross’ Columbus Circle offices, on Tuesday, gobbled up flyers calling for the giant real estate outfit to be reformed. A passerby eagerly takes a #CountMeIn flyer outside Related offices at 10 Columbus Circle. 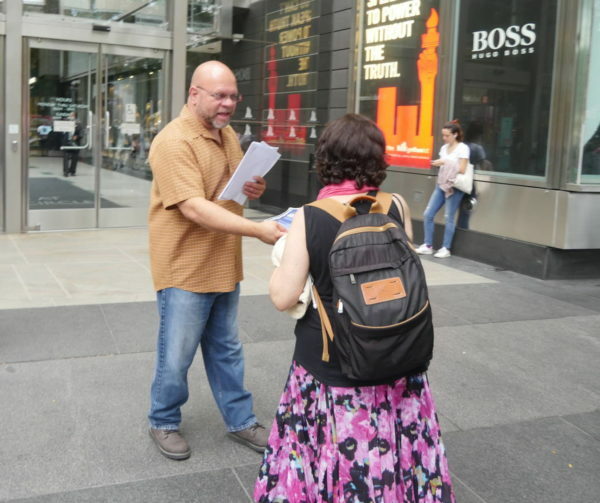 The leafleting outside 10 Columbus Circle this week, was part of the Building Trades’ ongoing #CountMeIn campaign against so-called “open shop” development at Hudson Yards and the rest of the city. So many pedestrians wanting to know more about the “rich vs. poor” protest outside the Time-Warner building snatched up flyers, that #CountMeIn organizers had to repeatedly replenish their stock. I can’t tell you how close we are to winning…but we’re close. — Bernard Callegari, #CountMeIn organizer. 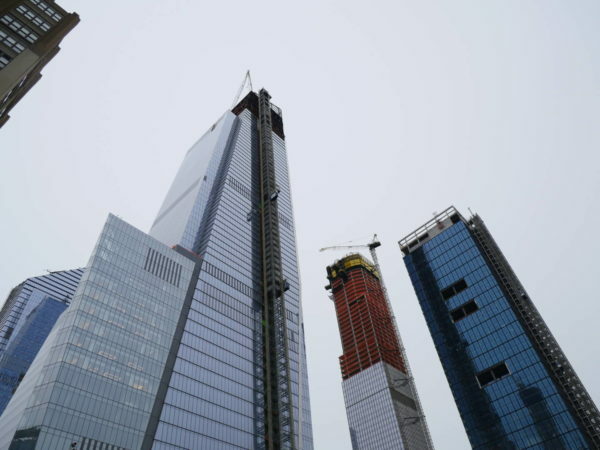 New York City’s Building Trades have been in a pitched battle with Related Cos since last fall, when the real estate giant decided it didn’t like the Project Labor Agreement covering Phase I of the massive Hudson Yards development on Manhattan’s West Side — and, instead, announced it would enter Phase II without a PLA, using nonunion labor on the cheap. 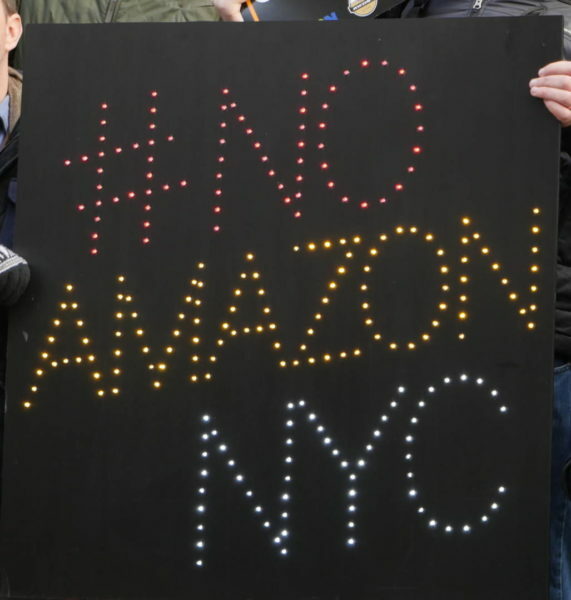 On Tuesday, protesters gathered outside 10 Columbus Circle blared horns, chanted “Step Down Steve,” and called for a new PLA for Phase II of the Hudson Yards development. Step right up: Curious passersby kept #CountMeIn organizers busy handing out flyers this week. 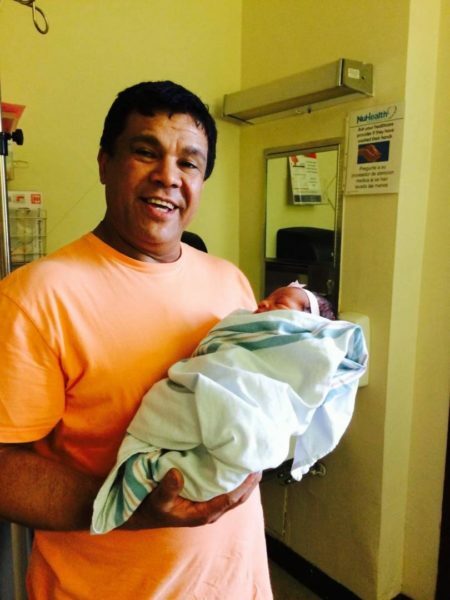 The #CountMeIn campaign reportedly has the support of a national Building Trades defense fund totaling $10 million. Protesters will be back in Related’s face once again later this week, when they rally outside The University Club of New York — NYC’s “Premiere Social Club” — located at One West 54th Street, site of a Related Cos shindig slated for 5 p.m. on Thursday, October 11. Those interested in taking part are encouraged to text “CMI” to 577-577 for all the latest details. 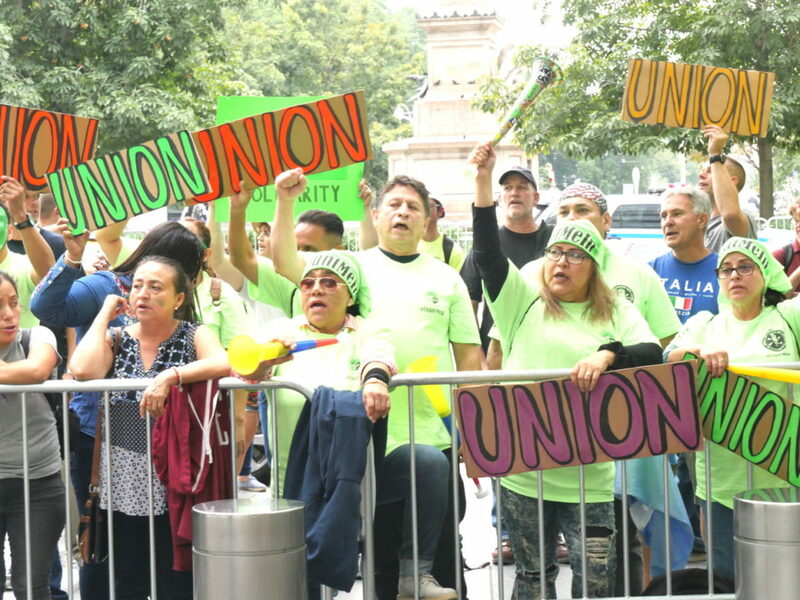 And on Tuesday, October 23, the #CountMeIn campaign is set to march from 6th Avenue and 50th Street to 10 Columbus Circle in what is expected to be the largest demonstration the Building Trades have organized against Stephen Ross and Related Cos. to date.